← Barbie is Truly for the Birds. He wasn’t yet forty when he completed this residence in Harbor Springs, MI. 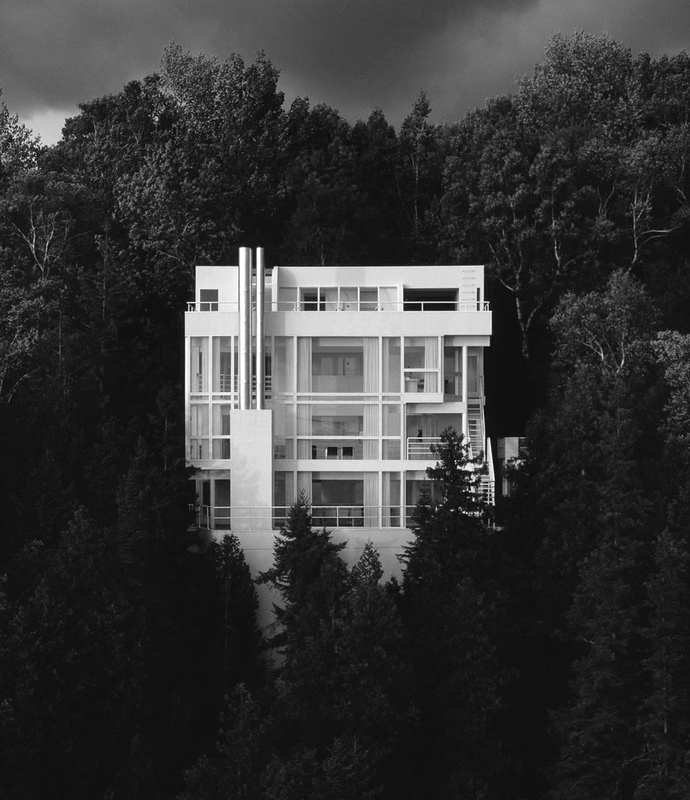 Yet, architect Richard Meier’s 1973 Douglas House remains one of his landmark structures, and the building that, with what would become his trademark white exterior palette, declared him a force to be reckoned with. This somber black & white image may be the best ever made of the site. Framing the home against the deep foliage that surrounds it, the near-charcoals of the natural environment form a womb-like cove for Meier’s gleaming angles. Even with a dark sky threatening, the futuristic house radiates a serenity for the ages. It’s striking, yes…but I think I’d feel like I was living in a sterile office building in the year 2525. Not exactly \cozy\.